NATIONAL HARBOR, Md. — A group of astronomers and engineers is seeking to convince NASA to study in-space servicing and assembly of future space telescopes, including the role the proposed Deep Space Gateway could play to support it. During a panel discussion at the 231st Meeting of the American Astronomical Society here, members of an ad-hoc group formed last year to study the topic argued that servicing and assembly techniques, involving astronauts or robots, could enable both servicing of telescopes to extend their lives as well as assemble future observatories too large to launch in a single piece. NASA has taken very different approaches to servicing for its flagship space telescopes. 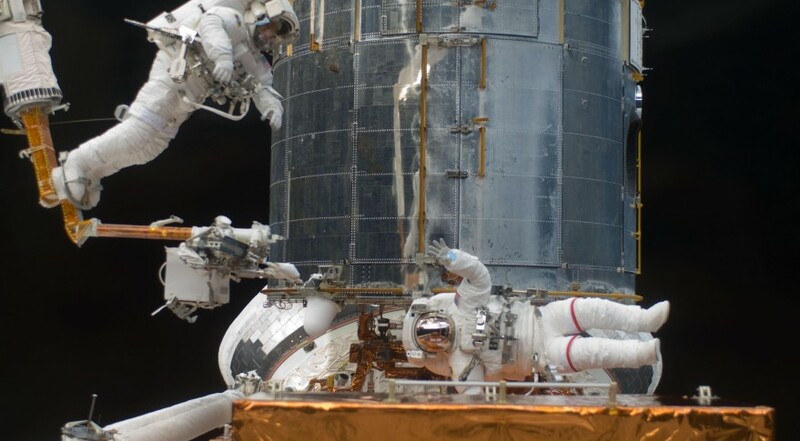 At one extreme is the Hubble Space Telescope, which was repaired and upgraded on five shuttle servicing missions between 1993 and 2009, allowing the telescope to overcome initial problems and improve its performance. The James Webb Space Telescope is at the other extreme, with no capability for servicing. Once launched, the spacecraft will go through a complex sequence to unfold its mirror and deploy a large sunshield, all without the ability for an astronaut or a robotic spacecraft to fix anything should that deployment go awry. To drive that point home, Grunsfeld displayed a slide. “This is the full description of the James Webb Space Telescope servicing plans,” he said. The slide was blank. While JWST is not designed for servicing — Grunsfeld said it might be possible, but risky, to do some kind of robotic refueling mission for the telescope about 10 years after launch — the Wide Field Infrared Survey Telescope (WFIRST), the next flagship mission after JWST, will have some support for robotic servicing. Adding latches and modular interfaces for such servicing increases the cost of WFIRST only slightly, he said, and those costs can be recovered by savings during integration and test. The group is also working to convince the teams working on four ongoing studies of large mission concepts for space observatories, intended to support the next decadal survey for astrophysics to be completed in 2020, that they should incorporate in-space servicing or assembly technologies. “Some of the teams are very receptive, and others are just pedaling as fast as they can to get some of their concept studies done prior to the decadal,” Grunsfeld said. Representatives of all the mission design teams were at a November meeting to discuss servicing and assembly technologies, he added. “Some of them hadn’t considered any kind of serviceability. I think we actually opened their eyes” to concepts like making instruments modular and easily replaced. NASA’s proposed Deep Space Gateway, a human-tended outpost in cislunar space, could also support servicing and assembly of space telescopes, serving as a base of operations for astronauts working on such spacecraft. “If that comes about, it would certainly make a huge advance to assembling them in space,” said Ronald Polidan of Polidan Science Systems and Technology. Polidan said that the group, at its November meeting, suggested that NASA work with industry and academia to study the roles the Gateway could play in assembly and servicing of observatories. That needs to be done in the near future, he said, in order to ensure that any specific requirements for those activities are incorporated into the overall requirements of the Gateway, as well as ensure the Gateway design does not preclude such work. Whether or not the Deep Space Gateway is used for building and repairing space telescopes, Polidan and others argued that in-space assembly will ultimately be needed as the research demands by astronomers lead to observatories too large to be launched from the ground, and perhaps too expensive as well.